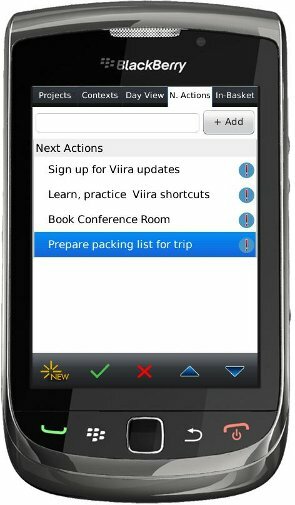 Next Actions are a core concept in Getting Things Done and Viira helps you manage those with ease. 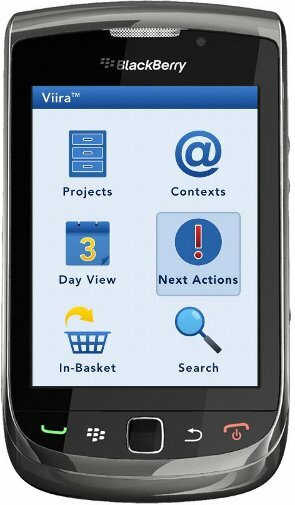 Mark any actionable task as a next action for it to appear in the Next Actions view. You can order the next actions based on their priority or sequence by which you want to complete them. Next actions appear with a special icon in any list, be it project, context or day. Next actions are also automatically displayed at top of the list in order to help you focus on what is actionable first. All tasks can be marked as a next action including email tasks, contact tasks, memo tasks and SMS tasks. Start the Next Actions view from the Viira home screen. The Next Actions view helps you focus on tasks that are actionable.